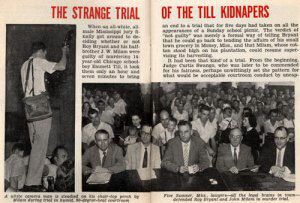 I was about 10 years old when I picked up a Jet Magazine and saw the face of Emmett Till on the cover. 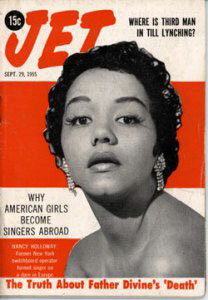 This little magazine type-booklet was a source of news and entertainment for the black communities. It covered everything from politics to show business. The picture showed Emmett Till’s face twisted and distorted, beaten beyond recognition. He looked like a monster from some horror movie. The article told how his mother wanted the world to see what the murderers had done to her son. She wanted an open casket at his funeral. She didn’t wanted any corrective cosmetics done. It was as if she wanted everyone to feel her pain as she grieved and looked at her son’s pulverized face. Immediate fear came over me. That moment, that very moment, I understood that my life was in danger. Danger, because I was a black boy, too. Neither my mother nor my father sat me and my brothers and sisters down to explain what had happened. Someone may have said, “White men committed this murder.” I realized then that there were white people in this country who hated blacks, and they would kill me, or any other black kid, if they got mad at us. It didn’t make any sense to me when I found out about Emmett Till, who was murdered because he supposedly whistled at a white woman. Beaten and murdered for whistling at a white woman? At that very moment, I wished I were white. Not because I didn’t like myself, but because I didn’t want to be hated like that. Why did I have to be born black, was my next thought? I hadn’t had any bad experiences with any white people up until that point, and just didn’t understand it. Emmett’s face would stay in the front of my mind for years to come. I eventually suppressed my feelings but never forgot that day. I never spoke to anyone about it. I never shared how this picture affected me. I started to distrust and dislike white people. I waited until they showed me that they would not hurt me before I trusted them. As I got older, I begin to see more examples of racism. I remember getting my head slammed against the blackboard in grade school, by my white teacher, because he thought I was talking. My class was in line and ready to be dismissed. He came over to me and asked me why I was talking. Next thing I remember, my head was slammed against the board. I was too little, and too afraid, to fight back. My cousin went home and told my mother. They must have run home, which was only a couple of blocks away, because my mother and my older cousins came up to that school and chased that white man down the street. I said something to challenge him and the next thing I knew, he was beating me like his personal punching bag. Someone ran and told my older, shorter, but stronger, brother. Together, we beat him up. The school suspended us and told us we couldn’t return. The boy’s father told us that he had been training his son to fight and he didn’t press any charges! My memory is obviously vague, but he may have thought his son should have been able to handle my brother and I. We were both under 5-foot, and together we may have weighed 225 pounds. It would take time and wisdom to change my mind about white people in general. The 1960’s cultivated a growing liberal white student movement. I saw free-spirited young whites protesting unfair treatment towards blacks, and America’s involvement in the Vietnam War. Additionally, I heard and read about some of the Freedom Riders, who were white, and risked their lives to help further the cause of civil rights in the South. I saw liberal minded whites helping blacks against the systematic prejudices engrained in this country. That began to give me hope for our nation. Today, we look at the killings of black men and boys by white cops all over again. Seems like history is repeating itself. Now it’s Ferguson, Mo., where a black young man gets shot by a white police officer, and Staten Island, where a white policeman’s choke hold kills a black man. The same questions we asked years ago, black people are asking again. Protesting and organizing against racism and injustices appear to be starting from square one. The younger generation is trying to determine which strategies are going to be the best and most sustainable. Why are we asking the same questions and feeling the same frustrations? I wonder how many young blacks have read the volumes of books and studies that have already dealt with these problems? My question is this, how many more killing, shootings, and murders? How is this affecting our young b lack kids? 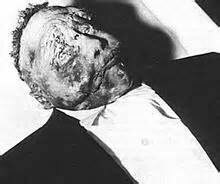 I remember seeing the picture of Emmett Till and how it affected me. Today’s technology allows for even more rapid, and continual, high definition videos and pictures of every killing of blacks, at hands of white cops. What are the psychological and social affects on black minds? How long will it take for black kids to recover, if they recover at all? Ferguson is not new. Eric Garner is not new. 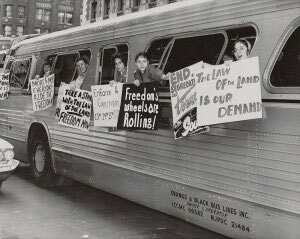 Protesting is nothing new. When will black protests matter? When will black people and their lives matter? On the other hand, having a black President is something new. Will he be able to use all of his powers to put together real programs, training, laws, that will be more than what we have experienced in this country? He isn’t the Messiah or a god for black equality, but he can make a small difference by ordering Federal investigations into these killings. He has said there will be money put aside for body-cameras and training for police officers. Now, will a Congress, controlled by an adversarial House and Senate and hell-bent on fighting the first black President on every important issue he supports, be determined to stop laws that could end some of these killings? Will it be a repeat of history? Blacks have been aliens and strangers in a strange land for too long. I enjoyed your article very much. I’m looking forward to reading more. Your journalistic pen is working very well. Great blend of the the then and now. I like your use of photos to educate the young and those unaware of American History.